In November our attention turned to all things ‘winter preparation’ – a little later than was sensible as apparently winter normally starts in November, but hey ho! Our first jobs were to make sure we had a constant un-frozen water supply to the house (it has been suggested the temperatures can fall to minus 20deg around here! ), and to sort out where the rain and melting snow will go. We do have a Comune water supply providing us with fresh drinkable water that we connected to when we first moved up to the house. Unfortunately, the connection and meter is 250metres away in our neighbour’s driveway. When we first moved up here, we laid a ‘temporary’ supply pipe above ground just to ensure we had water to the house (25mm plastic tube specifically for drinking water – identified by a blue stripe along its length and rated at 16Bar pressure). We are fortunate enough to have really high water pressure in the area which is great for washing the car (obviously not in summer when we are asked not to use excessive water) – but a little too high for standard domestic taps, so we also installed a pressure regulating valve to reduce it to 3.5Bar, a meter so we don’t have to run up to our neighbours driveway every time we want to take a reading, and an in-line filter we installed due to being told the water quality can vary in how ‘clean’ it looks – hmm. 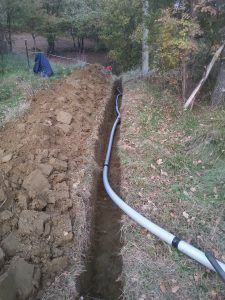 Anyway I digress – we just laid this long pipe over the ground through fields and woodlands to our house, and as we didn’t know where we would run the pipes through the house, the filter and meter were also installed outside. We had cool fresh water in spring, it was too warm in summer (40degC – although it did save on heating our water for showers) – but we knew we would have problems in winter with the current set up – it will definitely freeze if left uncovered, so we had two options – 1) Disconnect from the Comune supply leaving the pipe empty and use our well water, or 2) Bury the Comune water pipe below ground. We hope in the future to use our well (pozzo) to provide most of our water requirements instead of relying on our ’varying quality’ Comune water and of course having to pay for the stuff! We do have a well at the entrance to our land that is about 9metres deep and holds around 15m cubed of water which should provide us with all we need. It is quite common where we live for houses to have their own natural water supply, though many like ours have fallen into dis-repair and as such there are local laboratories open to the public to analyse your water quality, which is what we did 8€. We visited one such Lab and were advised of the specific size of samples we needed and how many, and a week after supplying them with these, we had our results – chemically it is excellent quality but unfortunately does contain low levels of ‘animal bacteria’, so don’t drink it! Now they tell us, after tasting it the first day we opened the well door – mmm how clean and fresh it tastes we said (I think I just threw up a little in my mouth). So in order to make the pozzo a usable water source, we will need to pump it empty, clean out anything we find and refill. 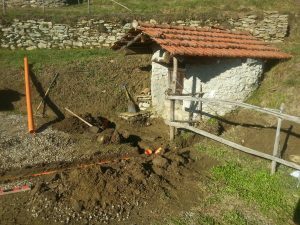 Now, at the moment we are not even certain if this is actually a well (that fills from sub-terranean springs), or simply a storage tank (cisterna) to hold rain water and snow melt– in which case we need to fill it somehow. Given that it did fill up last winter when the snow melted, but has not refilled during summer when we were using it to water our vegetables, either the bottom is blocked with years’ worth of silt preventing any natural spring from entering the well, or more likely it is, in fact, a cisterna. So, with our suspicions that we have a very large cisterna, currently half full of undrinkable water, we opted to continue using our current Comune supply (at least for the foreseeable future), which means we need to bury it below ground to stop it freezing – 800mm below to be precise for our region, to ensure it does not freeze during a harsh winter. As this is an extremely labour intensive job (see below), we also opted to insulate the entire length of the tube – a bit belt and braces but you will understand why in a minute. 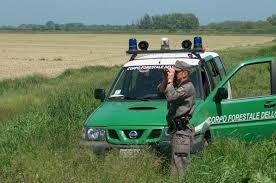 Here in Italy, all ground works are monitored by the ‘guardia forestale’ (basically a division of the police that ‘control’ anything carried out on the land from excavation, to tree felling and even mushroom picking) – and when I say ‘monitor’, I mean that you need to pay for permission! To use an excavator, means we would need a project designed by a geometra, approval by the Guardia and the local Comune and wait a few weeks before we could even think about starting – or we could pick up a shovel, dig the trench by hand and pay no-one, start when we were ready and save around €1000 – guess which method we decided on! Trying not to think about how much digging this would involve, we asked our neighbour for her permission to dig our trench over 150metres of her land up to our own land in the shortest possible route – to which she kindly agreed. So we started full of enthusiasm – nice soft earth and progress was swift, until we hit a half anticipated but almost forgotten area of rock (needless to say the trench isn’t 800mm deep everywhere, hence the 16mm thick pipe insulation we decided to fit along the entire length). It took us two back breaking weeks, but it is done 9€. I later estimated it was roughly 90 tonnes of earth we had dug and then replaced – you can’t even see what we have done for two weeks of very hard graft – it had better not freeze! Oh and whilst the trench was open, we also buried some electric cables 10€ in 50mm diameter conduit (they don’t have armoured cable here in Italy) to control the pump we have immersed at the bottom of the well, instead of the extension lead we currently have laid over the ground (I also ran an extra length of cable – cat5e networking cable – to allow us to install a water level measuring system eventually – I’m a bit of a nerd really). Edit: After all this work, our first really cold night of minus 7degC, resulted in … a frozen supply!!!!!! Not sure how I managed to overlook this but the very last section of pipe next to the house leading to the filter was still exposed, and I had left the filter and meter units outside (insulated as best I could, but still outside). These units froze and the glass in the meter cracked – so off I went to our neighbours to turn the water off, swear a bit (in Italian now of course) as I dug her access cover out of 2 feet of piled up snow and ice, remove the meter, add more insulation and bodge the system back together. The intention was to run this section of pipe below the house floor into the cantina when we dig out for the septic tank, but we were not quite ready for that, hence the problems – I am happy to report that this was resolved during the septic tank job and we have had cold weather since and still had running water – menomale (thank goodness)! At present, all our roof water drains out onto our driveway giving us basically a stream down the drive – which is pretty and gives me a good reason to have a Land Rover, but not really practical. 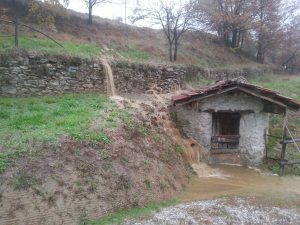 And on November 24th, we were shown just exactly what a heavy downpour can do – we had four days of constant heavy rain, causing flooding virtually everywhere in the valley bottoms and local towns. It was the worst flooding for around 25years, so at least we can understand where we are likely to have problems … and problems we did have! The house actually survived very well – it is built into the rock of the hillside behind us and the parts of the house exposed to the rockface are the storage areas where it is less important if there is a little moisture, and there are various channels carved out of the floors to guide any water that does arrive – as the saying goes … they don’t built them like they used to! 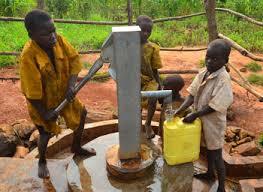 However, it was the land and the run off areas that caused us the most problems. As the ground quickly became saturated, the earth began to lose its grip on the rock below and we had a mini landslide (frana) at the back of the fienile – fortunately in a position where we had planned to remove some of this topsoil anyway so it saved us a job in the future, and didn’t do any damage to the building. Our biggest problem though was the run off when the water actually re-surfaced. The pozzo has been constructed at exactly the right position where all the underground water runs, but unfortunately when it is full, there is nowhere for it to go … except onto our driveway. 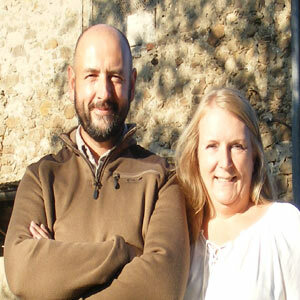 And if you read Helen’s blog around that time, you will have ready about ‘Barry the badger’, or as he will now be known as ‘Barry the Ba*****’. We have a badger sett in the field above the house but this summer they decided to create an extension and new entrance lower down the hillside – which also became an exit for all the rain water – I presume Badgers don’t need to satisfy the Guardia Forestale regulations on excavations. So we ended up with a lot of water and mud across the entrance to our driveway. Gave Barry an eviction order. Installed a 125mm diameter drain pipe from the existing house roof downpipes to the pozzo 11€ in the trench we had opened for the Comune water supply. We opted for such a large pipe, as for every 80m2 of roof, you need a 80mm downpipe – we have four and when it rains heavy here these could all be full and we didn’t want a bottle neck! This ensured the water from the roof didn’t run over the garden or top of the driveway and also allows us to collect the water whenever it rains – even if it is never clean enough for us to drink, it will definitely be used for watering the vegetables in the Orto … so two birds with one stone or a badger if I see him digging again! Installed an overflow pipe in the pozzo so that when it is full, it doesn’t overflow onto the drive. One thing I found different here to the UK is the size of underground drainage pipes – which caused a lot of frustration on our next job – the septic tank. In the UK were used to using 110mm pipe for all drainage – orange below ground and grey above – simples! But here they use 80mm, 100mm and 125mm below ground and 32,40,90,110 above ground – and that gets tricky when you want to connect the two systems together – but more about that in the next post, for now we have a surface water system that works and a fresh water supply that doesn’t freeze and that will also still be cool and fresh in summer.